VitalScan SudoCheck+ has been created to enable a precise evaluation of sweat gland function. It is based on a measuring method, whereas patients place their hands and feet on stainless-steel electrodes and are exposed to an incremental low direct voltage - lower than 4 V - that is released in intervals of two minutes. What is being tested is the electrochemical reaction between electrodes and chloride of the, through low voltage stimulated sweat glands. This active, new method provides information and evidence of a sweat dysfunction that might otherwise not be detectable in physiological conditions. Bioelectrical Conductances (BEC, in microsiemens, uS) for the hands and feet, express the quantitative results, while a risk score is derived from demographic data and the BEC values. 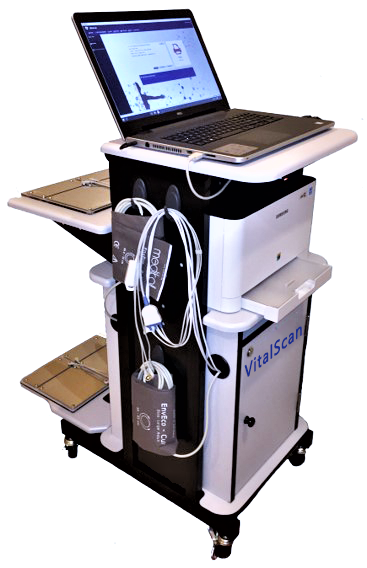 The VitalScan SudoCheck+ system, in accordance with the 21 CFR 882.1540, represents a galvanic Skin response device that provides skin conductance measurements on a computer screen. VitalScan SudoCheck+ is, similar to a galvanic skin response stress test, an active test that measures the sweat glands` capacity to release chloride ions following an electrochemical stimulation. It works by measuring the electrical potential difference caused by the electrochemical reaction of electrodes, which are applied to the skin and are stimulated by a low voltage of variable amplitude. VitalScan SudoCheck+ comes with 5 independent electrodes for placement on the body, for example feet or palms and other areas with a high number of sweat glands. VitalScan SudoCheck+ provides information that determines the cardiometabolic risk in patients. The test, equivalent to a galvanic skin response stress test, measures the sweat glands' capacity to release chloride ions in response to an electrochemical activation. The advantages: VitalScan SudoCheck+ does not require any patient preparation, such as blood drawing or fasting; it is non-invasive and delivers immediate results, with findings that are ready to use after a short and uncomplicated test of merely 2 minutes. VitalScan SudoCheck+ has been developed for use by general practitioners, pharmacists, cardiologists and neurologists to assist in the effective screening of cardiometabolic risk in patients. Sudomotor dysfunction has been established as one of the earliest detectable neurophysiologic abnormalities in distal small fiber neuropathies. As an index of the severity and distribution of automatic failure, quantitative assessment of sweat response has been proposed. It will also serve as an early indicator for regeneration of small fibers. VitalScan SudoCheck+ measures bio electrochemical sweat skin conductances (BEC), which are directly connected to the capability of the glands to transfer chloride ions and which reflects small-C fiber status. VitalScan SudoCheck+ is a fast and easy method to measure sweat function. 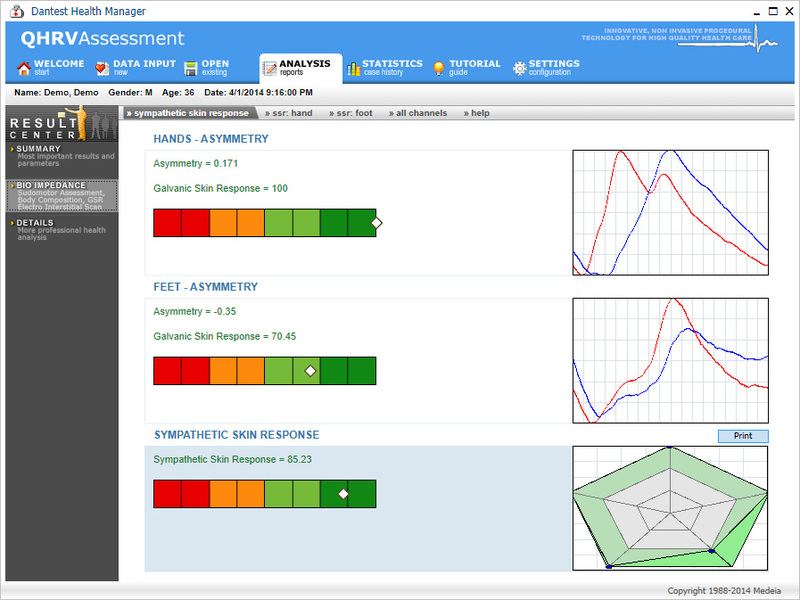 Analyze and test VitalScan SudoCheck+ responsiveness and accuracy in detecting diabetic neuropathy and compare it with existing standardized tests for the diagnosis of diabetic neuropathy. 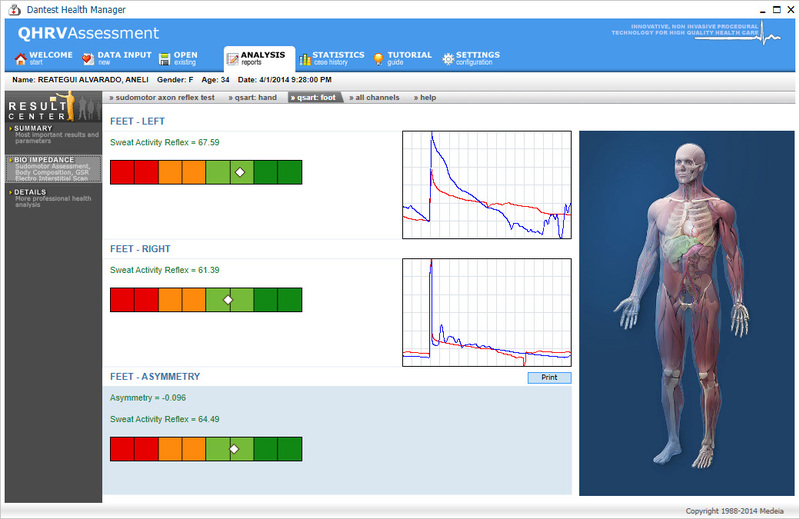 Evaluate VitalScan SudoCheck+ in patients with Diabetes Mellitusm, as an instrument to assess autonomic neuropathy and neuropathic pain. VitalScan SudoCheck+ is an innovative, sensitive tool for the detection of diabetic neuropathy, especially painful diabetic neuropathy. As sweat glands are innervated by small c fibers, which are also involved in pain pathways, precise measuring of the sweat gland function can identify that cause. VitalScan SudoCheck+, a sensitive device to detect neuropathy in patients with diabetes mellitus. VitalScan SudoCheck+ results correlated significantly with clinical neuropathy scores, pain scores and measures of autonomic dysfunction. Quantitative Sudomotor Axon Reflex Test (QSART) is a test to evaluate the integrity of the postganglionic sudomotor system along the axon reflex to define the distribution of sweat loss. This is accomplished by the release of bio-impedance electrical stimulation the skin which activates receptors on the eccrine sweat gland. 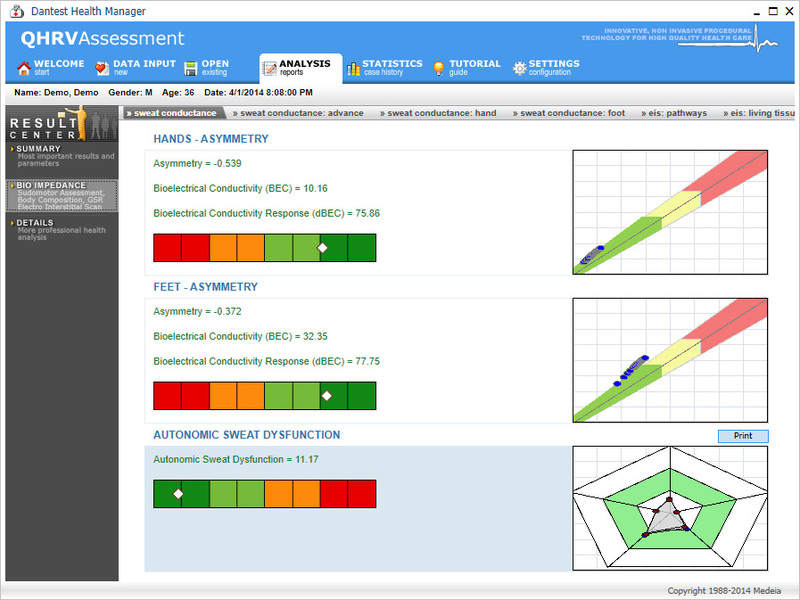 The sweat response is recorded from four sites (forearm and 3 lower extremity sites) and assessed for deficits. The QSART is a test that measures the autonomic nerves that control sweating. The test is useful in assessing autonomic nervous system disorders, peripheral neuropathies and some types of pain disorders. The test requires a mild electrical stimulation on the skin, which allows to stimulate sweat glands. The QSART measures the volume of sweat produced by this stimulation. Sympathetic Skin Response (SSR) measures change of the electrical potential of the skin. The recorded skin potential comes from the activated eccrine sweat gland. The amplitude and configuration are adjusted by sweat gland epithelium and the overlying epidermis. As a physician, you know that the Body Mass Index (BMI) by itself is not sufficient to analyze a patient's health status and body composition thoroughly. Fat, muscle, water and other important indicators of underlying medical conditions are not considered in the BMI. Reason enough for Medeia to develop exactly that - a new device that measures patients' body compositions - the "BCA" (Body Composition Analyzer). As a component of the VitalScan SudoCheck+, it produces all these measurements and values at medical science highest standard levels. As a result, now a tool exists that, in less than 20 seconds, can determine fat mass, extracellular and intracellular water, and skeletal muscle mass, all fundamental assessment components to aid an accurate patient evaluation. Simple, user friendly, and with medical precision, this device can conveniently be integrated into your examination routine. In order to make VitalScan SudoCheck+ the optimal medical Body Composition Analyzer for working conditions in hospitals and medical practices, we looked beyond the many technical requirements and at the advantages and benefits that are valuable and of importance to medical staff and patients. We understood it had to be fast and easy to use and the measurement results had to be reproducible under normal clinical working conditions. 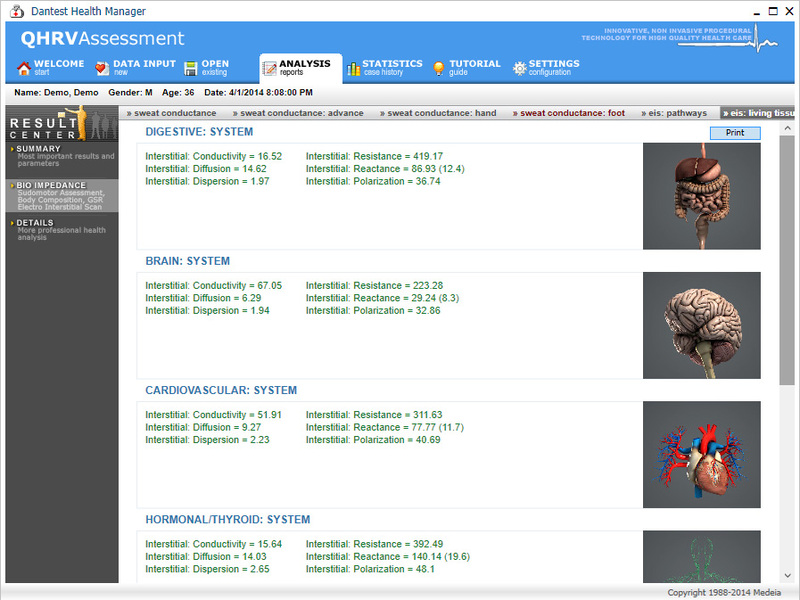 That's' how we designed and build VitalScan SudoCheck+. The VitalScan SudoCheck+ provides physicians and other users with a myriad of diagnostic options. Analytical modules provide accurate ratios for, for example extracellular to intracellular water, or fat mass to weight, and present doctors with indications of medical disorders that would otherwise need additional examinations to be diagnosed. The graphic presentation of the results is another benefit. 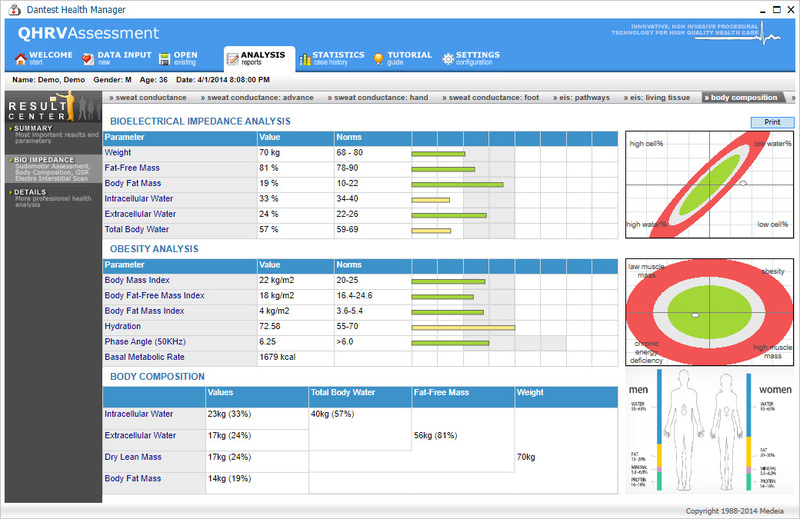 It provides a summary and overview and helps visualize the data. Bioelectric Impedance Analysis (BIA) is for research use only. A weak DC current, with the help of 6 tactile electrodes, is sending alternatively between 2 electrodes with a sequence, and a record of the electrical conductance of 11 pathways in the subject's body is displayed by the VitalScan SudoCheck+ system. The VitalScan SudoCheck+ system is a galvanic Skin response device that provides skin conductance measurements on the PC screen in accordance with the 21 CFR 882.1540. Electro Interstitial Scan is for research use only. *	VitalScan SudoCheck+ is an FDA 510k cleared product. Please contact your local sale representative for more detail information. Some components in the US or EU version may not be available or may be available for research purpose only.